Interested in a career in travel, aviation, policy and regulation or all three? 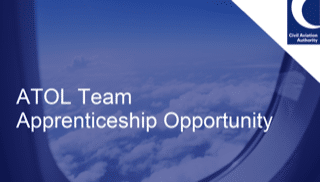 The Civil Aviation Authority are currently recruiting for an 18 month ATOL Crisis Management Officer Apprenticeship, based in London. The aim of the role is to provide financial protection to consumers affected by an ATOL holder failure in the form of repatriation, a replacement booking or a refund, as appropriate. This involves agreeing and authorising payments to holiday service suppliers, various third parties and consumers and liaising with Claims Handling Agencies. If you have good analytical, communication and influencing skills, follow the link below to find out more and kickstart your career in aviation.